A beautifully presented character semi detached home, with planning permission to extend further, situated in a semi rural hamlet and featuring a superb rear garden backing onto open farmland. The property itself comprises two reception rooms, both featuring wood burning stoves, the sitting room opens into the country style kitchen with oak work surfaces and breakfast bar and that in turn leads to the practical utility room and cloakroom. On the first floor the master bedroom occupies the rear of the property with stunning views over the garden and countryside beyond. The second bedroom is a generous double with built-in wardrobes, the third bedroom and family bathroom complete the accommodation. Planing permission reference: WA/2016/1995. From our office turn left into the High Street and proceed to the second mini roundabout. Continue straight over into the Horsham Road and follow the road for a couple of miles to Ellens Green. 4 Wayside Cottages is on the left hand side before you reach Furzen Lane. Ellens Green is a hamlet situated almost midway between Cranleigh, Rudgwick and Ewhurst villages. There is a village hall with playground nearby and local pubs include the highly regarded Chequers at nearby Rowhook and The Kings Head and The Fox in Rudgwick village which is approximately 2 miles distant. Rudgwick offers local and private schooling, doctors and dentist surgery and everyday local Co-op store/post office. Rudgwick is situated approximately 12 miles south of Guildford and 8 miles from Horsham both having a comprehensive range of shopping and leisure facilities and mainline stations to London. Nearby Cranleigh also offers a wide range of shops and a leisure centre. Comprising; close coupled WC, wash hand basin. Spacious double bedroom, rear aspect with far reaching rural views over adjoining farmland. Spacious double bedroom, front aspect, built-in wardrobe cupboard. Comprising; panelled shower bath with glass shower screen, pedestal wash hand basin, close coupled WC. The property sits back from the road behind a gravelled driveway and parking area. The driveway extends to the side of the property via a five bar gate leading to a single detached garage located to the rear. Beyond the garage is a summer house/home office. The rear garden is a wonderful feature of the property with a good size patio area opening out onto well tended lawn and enjoying far reaching rural views across the adjoining farmland. Planning has been obtained for a side extension creating a larger reception hall with downstairs cloakroom and a lovely open plan kitchen/dining room across the rear whilst also improving the upstairs. 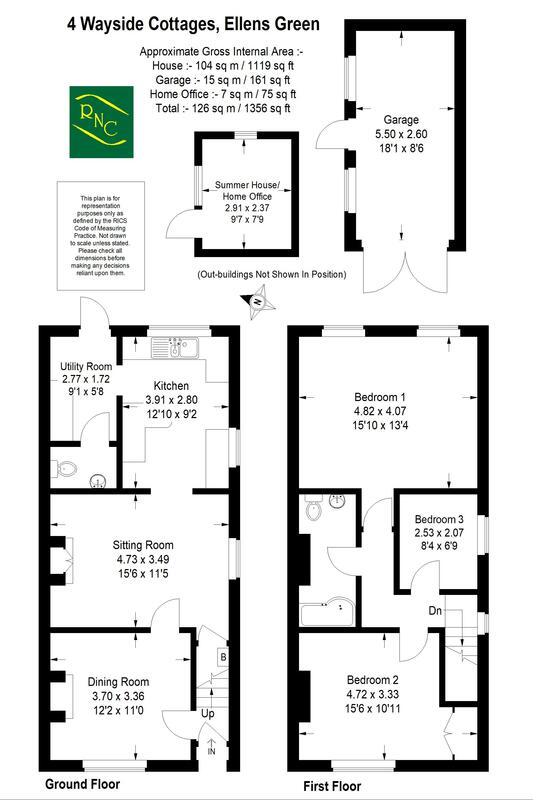 Bedroom 1 and 3 would both be larger and there would be the ability to add an en-suite or create 4th bedroom.